Kindergarten art is off and running! This week we are learning about different types of lines. In the hallway, our teachers like us to be in straight lines, but in art the lines can be all kinds of crazy ways! We practice making different kinds of lines with our fingers, then draw them with color sticks. Wavy is soft, zigzag is sharp. Loopy lines are like a roller coaster! When we have drawn some lines with color sticks, we use strips of paper (straight lines) and see if we can bend, fold, and roll them to create new lines. We created zigzag, spiral, and even some that looped or looked like jack-o-lantern teeth! 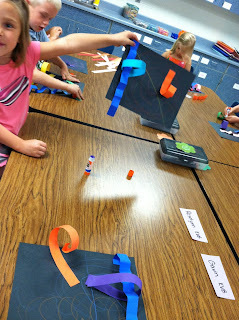 This is one of my favorite lessons to do with Kindergarten because not only does it teach basic skills with drawing and gluing, but it allows room to use their whole body. Moving is essential for these littles so early in the year. We get up and act out all the lines to help them learn the difference between all the different ways to draw a line. 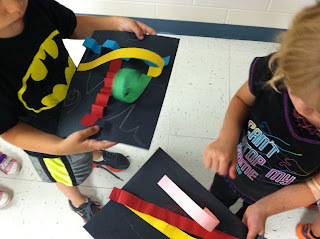 The black paper really makes them stand out, but I've done the same lesson with lots of color combinations. Aren't they fun!